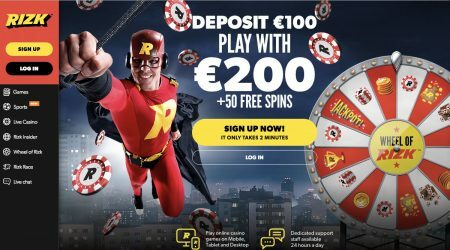 One of the few online casinos with a mascot, Captain Rizk is called upon to advertise many of Rizk’s most popular services. 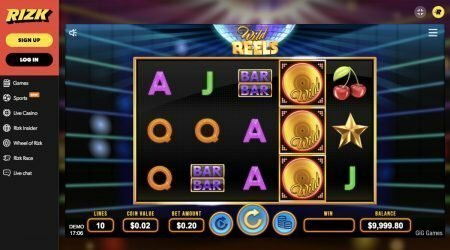 Along with the ongoing Wheel of Rizk promotion, the casino has brought together a selection of instant-play slots and games from software providers such as Quickspin, NextGen, NetEnt and Microgaming. These can be reached through a player’s mobile or on a desktop. Based in Malta, Rizk holds three licences: one with the Malta Gaming Authority, another with Curaçao eGaming, and another with the UK Gambling Commission. This should provide players with confidence when depositing funds at the casino, and it also confirms that Rizk is a trustworthy choice. The range of games is good, with all the usual bases covered, and the site is a joy to navigate, with superhero imagery and bright colours on each page. One of the main reasons why Rizk casino has amassed so many players is the range of available bonuses. The casino is very clear about what the conditions of each are, and players can choose to accept or decline these offers. Throughout each week, Rizk lays on various promotions – the most commonly offered bonuses are set numbers of extra reload spins on a certain game or limited time deposit bonuses. The welcome bonus at Rizk is available to all new account holders and becomes available after the first deposit has been made. It includes a 100% match of the funds paid in, up to a maximum of £100. The minimum amount for a deposit is £10. Once the bonus has been credited into a player’s account, they also receive 50 extra spins on Second Strike. If players receive a reload bonus of between 100% and 200%, then the wagering requirement is 40 times that. For reload bonuses of more than 200%, the wagering requirement is 45 times the bonus amount. The welcome bonus comes with a wagering requirement of 20 times the bonus amount. Any deposit bonuses and free cash bonuses expire after 30 days, so players must use their extra funds within this time, as well as meeting the wagering requirements. The level of play necessary to complete Rizk requirements is relatively high, so before agreeing to take the bonus, players should consider whether it is really worthwhile. Furthermore, not all games will contribute toward the wagering requirement – video poker games are an example. Others contribute at varying percentages: it is 100% for casino slots, 75% for classic slots, 50% for Live Dealer Roulette, and 10% for all other table games. The main promotion at Rizk is a game called Wheel of Rizk. This is a rolling campaign that provides rewards to any players that take part. However, the best prizes are reserved for regular gamers who visit the site every day and play a number of slots. Wheel of Rizk is presented clearly on the left-hand side menu bar and the rules are simple. As players move around the site betting on games or trying out slots, they begin to slowly fill up what the casino calls a Rizk Power Bar. Once this progress bar is complete, members are given the opportunity to spin the Wheel of Rizk for the chance to win a selection of prizes. Each spin also gives them the opportunity to reach higher levels with better rewards. 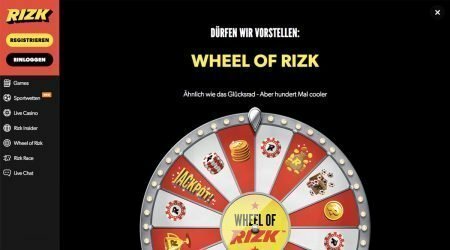 Frequent players will often find themselves at the Super Wheel of Rizk, with jackpots, double prizes and a set number of weekly spins. Rizk casino features some of the latest titles by software giants such as Microgaming and NetEnt. Most of the fan favourites in the Slots category are also available, most notably those that offer progressive jackpots and more opportunities for a big win. Players that prefer the classic casino experience will enjoy authentic table and card games, with plenty of variations and wagering options. Almost all games are available for free play, with the exception of a dozen games featured in the Live Dealer Casino, which is powered by Evolution Gaming and NetEnt. All too often, it can be difficult to locate the exact game needed because of the sheer volume on offer. At Rizk, everything is skilfully organised, with table games, 3D slots and classic slots each having their own area. The selection is further broken down into distinct categories, such as Hollywood, Rising Stars, Horror and Action, but players can also choose to use a search tool to find a game by name. Whatever the player’s choice, no downloads or extra software is needed to place a wager. Every item is run from the browser, and there are also plenty of games for people playing on a mobile. For slot fans, the selection is vast, with 3D, Video and Classic all covered in a range of settings and themes. Each title is well rendered with interesting characters and backstories, along with the odd bonus feature. 3D slots include Warlords: Crystals of Power, Mr Vegas, The Godfather, Enchanted and Glorious Empire, all of which are visually stunning. Progressive jackpots can be hugely lucrative for dedicated players and here there is a relatively small collection with around 20 titles. These are Hall of Gods, Mega Fortune, Mega Moolah and Arabian Nights, among many more with jackpots of up to £1m in some cases. 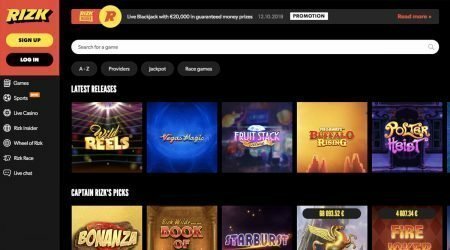 For gamers who have accounts with other operators, Rizk makes pooled network jackpots available. This means that individuals can pay into the same jackpot as players from different casinos to build up a substantial prize fund, which someone eventually takes home. The Video Poker area is especially fast-paced, with multi-hand versions and progressive games available through the simple interface. From Deuces to Joker Poker and Jacks or Better, all the familiar names are here. Table gamers are equally well-served, with classics including roulette, baccarat and blackjack, as well as their more specialised variants. 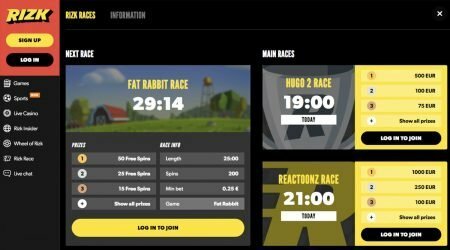 The live dealer games are presented by NetEnt Live along with Evolution Gaming, and give players the chance to interact with real-time games. This is the only area of the site that requires a separate sign-up. Also, there are no free plays, and only real-money wagers are accepted. Once inside, members can watch games such as Texas hold’em, poker and blackjack unfold through quality web camera feeds. Relatively new to the UK market, the Rizk sportsbook certainly looks the part. Decked out with a red and black livery, it features good odds on a wide selection of sports. Players can check at the top of the page to see symbols representing what is on offer. The range includes golf, volleyball, cricket, tennis and football, as well as a few eSports such as League of Legends. On the homepage, Rizk displays a list of the current odds for games that are live and also those that will be starting shortly. 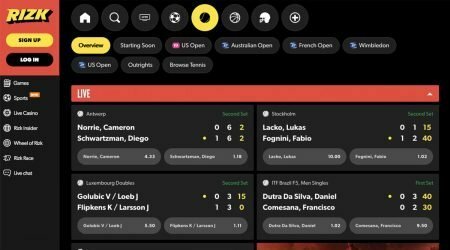 For more information about what will be offered in the future, Rizk provides a tab to access news about key events and tournaments that occur annually. 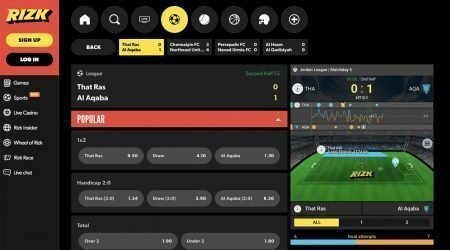 In-play betting is one of the most exciting ways to play, and fans can view a number of markets at Rizk, along with infographics that depict what is happening during a match. In the UK, members can pay in funds via Visa or Mastercard, along with Skrill, paysafecard, Neteller and Visa. There is no fee to use any of these methods, and the funds are available instantly. To make a withdrawal, account holders are normally expected to use the method that they used to deposit – there is no fee, but the process can take up to three days. Rizk is a well-branded casino that works hard to inject a sense of fun into the site. It provides a large choice of games, along with a brand-new sportsbook and fun features such as the Wheel of Rizk. The casino’s homepage is one of the least cluttered in the industry, with clearly defined menus, search functions and customer care tabs, but very little else. Unlike other operators who sometimes overwhelm a player with spam for their other sites, Rizk focuses very clearly on the key products. Security is provided by the most trusted European authorities, in Malta and the UK, so the level of risk to players is especially low. Moreover, every transaction is protected by SSL algorithms, and members’ funds are kept in separate accounts from those of the casino. The company’s portfolio is expanding daily, the menus are extensive, and the comic book graphics are great fun. For players who appreciate a quirky atmosphere and daily incentives, Rizk is an excellent choice.